Fortunately I am still enjoying my extended break in the Languedoc area of France and seeing some great wines. 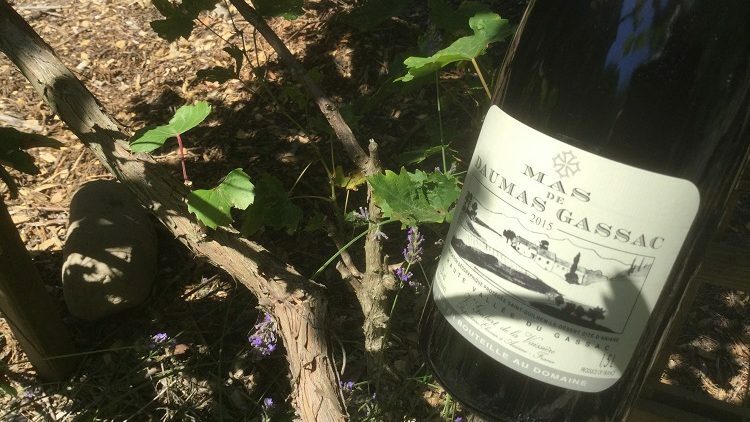 A few years ago I visited the iconic Mas de Daumas Gassac near Aniane which produce lovely white wines, but even better red wines. What a vineyard! The pride everyone has makes a visit a rare treat. We were there during the picking, vendange, and unusually for the Languedoc, they hand-pick the grapes. As we walked around, the pickers were insistent that we tried the grapes. The happiness in the vineyard was palpable. The high, cool vineyards with no thinning of the vines produces a classic wine. Plum, red and black fruit flavours, smooth as you like. Basically Cabernet Sauvignon grapes together with others to produce the right blend including Grenache, Cinsault and even Spain’s Tempranillo! A few suppliers in UK, notably Berry Brothers and Rudd from their store in St James’s or at their excellent bin-end store in Basingstoke. Then we went a bit ‘off-piste’ to near Chateauneuf du Pape to see Chateau Beaucastel where the owners, the Perrin family, joined up some years ago with Angelina Jolie and Brad Pitt to produce an excellent, but not cheap, Rose named Miraval. Attractive, of course, fruity and floral, light and very drinkable. A romantic bottle for summer, and amounts other, on sale at M&S. Leaving Miraval, we ventured south to the Mas Carlot for their Costieres de Nimes white cuvée, a delicious blend of Marsanne, Roussanne and Viognier grapes. A silky wine with melon, apricot and peaches flavours. Family-run and quite excellent. It can be purchased via Vineyards Direct, but many good Costieres sold in UK supermarkets. Off to visit relatives in Lyons next month so a wander around the Villages de Beaujolais. Please join me.